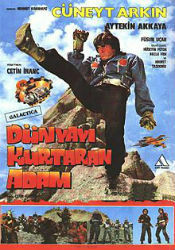 Following an opening narration that would make Uwe Boll impatient, two pilots Murat (Cüneyt Arkin) and Ali (Aytekin Akkaya) engage in a confusing space battle that ultimately ends up with them crashing on a remote rocky world. Here they discover that people are being forced to fight in arena style death matches under the watchful eye of Nimrod, an evil wizard who is looking to destroy the Earth for reasons only he understands. Murat and Ali smash rocks and run around shirtless, as they get themselves in shape and ready to save the day. The Man Who Saved the World is most well-known for the sheer amount of footage and musical cues that are lifted from other movies, most notably Star Wars (1977) and Raiders of the Lost Ark (1981). Any time there is a sequence in space, whole moments from Star Wars are inserted into the scene. They aren’t edited in any way that makes sense. For the all the good it does, the director might as well have just put up a card that said: “SPACE STUFF HAPPENS.” It’s funny for about two minutes before the unintentional humor begins to wear thin. Thankfully, once our heroes are on the ground, the movie has a wealth of absurdities to entertain the viewer. 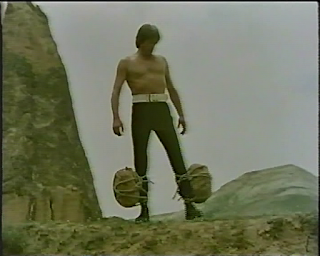 Turkish Lost in Space was a grim affair. After kicking around a dozen skeletons on horseback, and mixing it up with some of Nimrod’s other goons, our heroes soon discover that Nimrod needs magic brains to bypass the Earth’s defenses. Ali spends most of the movie desperately wanting to flirt with local women, something he fails at spectacularly. Our duo is very good at punching monsters, everything from blood drinking zombies, and red furred giant muppets, to a particularly nasty customer covered in brown hair with whips on the ends of his fingers. Say what you want about the craftsmanship of this film, it is very imaginative. 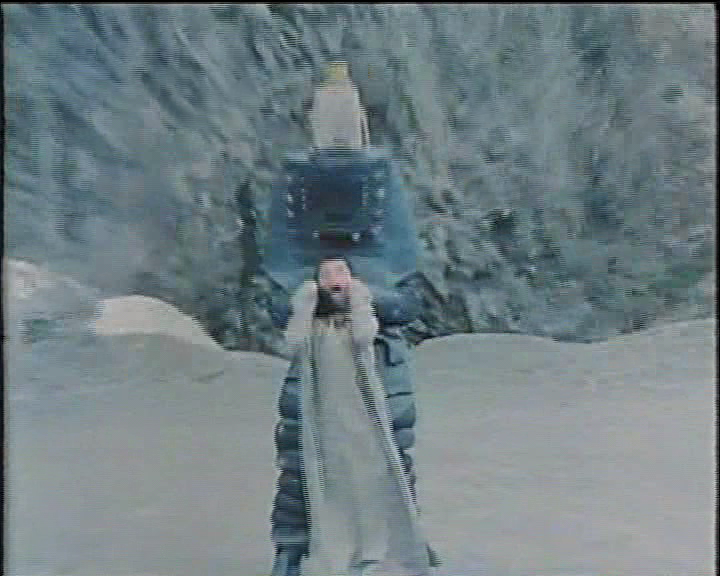 The Man Who Saved the World is as much a martial arts action film as it is a science-fiction film. What the fighting lacks in skill and precision, it certainly makes up for in sheer volume. The fights consist of mostly jumping and limb removal. Special note should be made of the pre-fight training montage that includes rock punching, more rock punching, Murat tying rocks around his legs so can learn to jump higher, and just in case you hadn’t seen enough, some rock punching. The Man Who Saved the World is by turns, hilarious and frustrating, but it always manages to be bizarre. Most importantly, there’s an underlying good humor to everything, and it’s hard to deny the leads have a certain charm about them that helps smooth over some of the rough edges of a film that is almost entirely made out of rough edges.